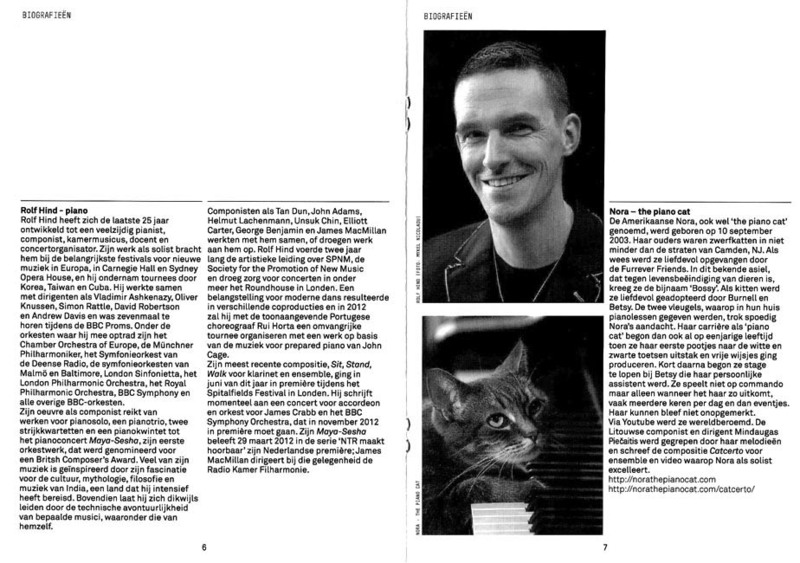 Mindaugas Piecaitis, the composer of CATcerto, just sent B&B a scan of one of the pages of the printed program for the recent performance of CATcerto in Amsterdam (November 11, 2011). As you know, CATcerto was composed by Piecaitis and based on my piano stylings. It features yours truly as guest soloist via a large video screen placed behind the orchestra. As of Nov. 11, CATcerto has been performed fourteen times in five countries. You can also read more about it right here on my website by clicking the “CATcerto” button at the top of the page. American lady Nora, also known as “the piano cat”, was born on Sept. 10th 2003. Her parents were stray cats in the streets of Camden, NJ. Being an orphan she was taken in the loving care of the Furrever Friends. In this famous animal rescue center that is against the putting down of animals, she was given the nickname ‘Bossy’. As a kitten she was lovingly adopted by Betsy and Burnell. The two piano’s in their home, that were used for giving piano lessons, soon took Nora’s attention. Her career as “piano cat” started when she was only one year old and put her little paws on the white and black keys and began to compose her first improvisations. Not much later she began an internship with Betsy who became her personal assistant. She doesn’t play by ordering her but only when she feels like it, often a few times a day and then only for a little while. Her talent was not being unnoticed. Through YouTube she became famous worldwide. The Lithuanian composer and conductor Mindaugas Piecaitis was touched by her melodies and wrote the piece ‘Catcerto’ for ensemble and video in which Nora excells as a soloist. Thank you so very much for the translation. It makes me so happy that I have so many fans and friends around the world. Give Pip a kiss on the head from me.